Installing Charitable Simple Updates is the same as installing any other Charitable extension. If you’re not sure how to do that, we recommend first reading our guide to installing Charitable extensions. 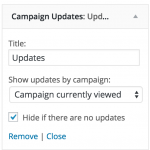 Once the plugin is activated, you can edit any campaign to see the new Updates tab added to the campaign’s advanced settings box. The Updates tab is added to the campaign’s advanced settings box. You can write your updates directly into the text area inside this tab. 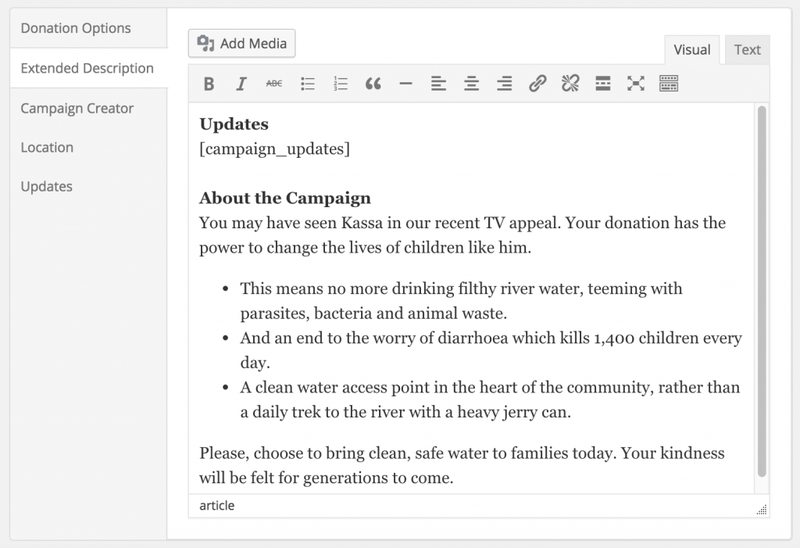 To display campaign updates inside a widget ready area, you can use the Campaign Updates widget. In your WordPress dashboard, go to Appearance > Customize and open up the Widgets panel (in certain themes, this panel may be named something else). Find the widget area that you would like to add the widget to, and then click the Add a Widget button, selecting the Campaign Updates widget to add it. You can choose to show updates by a specific campaign or limit it to the campaign currently being viewed. If you choose “Campaign currently viewed”, the widget will only display on single campaign pages. You can also choose to completely hide the widget if there are no updates to show. Adding the [campaign_updates] shortcode to the campaign description. You can see the ID of your campaign in the browser address bar. Here, the campaign ID is 11. If you’re comfortable writing a little PHP, you can integrate updates with a simple PHP function. This function will display the updates — you do not need to use echo or print to render them.